The Laser 128 EX is the successor of the Laser 3000. Like the 3000, it is fully compatible with the Apple II computer, but has enhanced features. Video Technology designed its own Apple II compatible ROM (Apple lost a lawsuit challenging it), this ROM holds an Applesoft compatible version of the BASIC. The "Open Apple" and "Closed Apple" keys have been replaced with "Open Triangle" and "Closed Triangle" keys. The drive and the external daisy-chainable SmartPort floppy drive is driven by Video Technologies custom "Universal Disk Controller" (UDC) disk array chip. The SmartPort supports Apple IIe/IIc UniDisks (3.5" and 5.25" models), Macintosh 3.5" drives (the ones without the buttons), Apple IIGS daisy-chainable 3.5" drives and Apple 5.25" disks. It is also designed to support the Chinook CT-series 20 MB to 100 MB SmartPort hard drives. The SmartPort can support two 800K 3.5" drives, two 140K 5.25" drives, and one 100 MB CT100 hard drive simultaneously daisy-chained to each other. The Apple bus compatible expansion slot can hold an Apple High Speed (DMA) SCSI controller for running additional SCSI based storage devices. 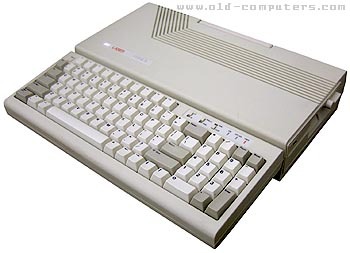 This unit was so successful that Apple Computers was prompted to upgrade the IIc to counter it. The result was the Apple IIc Plus, also released in 1988. The IIc Plus had a 4 Mhz Western Design Center 65C02 processor, an 800K 3.5" drive built-in, and an External Drive "SmartPort" capable of the same tricks as the Laser's. Although the two units were similarly matched, Video Technology actively advertised the Laser 128EX/2 while Apple had moved on to promoting the Macintosh. The Laser became the most successful Apple II clone ever and this model was 99.8% IIc Plus compatible. The only two pieces of software the Apple magazines reported as incompatible were The New Print Shop (Br�derbund Software) and HomeWord (Sierra). In North America, the Laser was aggressively marketed in Sears department stores, where it eroded its niche rival's sales, the Commodore 128. This Laser unit's case was also used to make a Turbo XT PC clone. The PC clone and the Laser 128EX/2 shared the same case. They looked identical except for the label. Instead of "Laser 128EX/2," the XT had "Laser XT10"
Later, Video Technology also had a line of PC machines ranging from an XT 10 MHz, three 80286 versions, a failed 386 and a very robust but expensive 486 before they stopped making them and went back to electronic toys. GRAPHIC MODES All the Apple IIc modes, with an extra set for RGB: 40 x 48 / 80 x 48 / 280 x 192 / 560 x 192. 4 lines of text mode can be mixed with a truncated the 40 x 48 and 280 x 192 modes. SIZE / WEIGHT 38 (W) x 32.5 (D) x 7.7 (H) cm. see more Video Technology LASER 128 / 128EX / 128EX2 Ebay auctions !